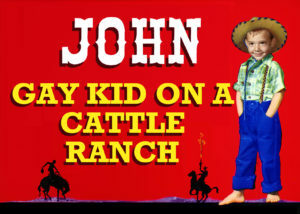 Following a sold-out engagement at New York City’s historic Duplex Cabaret Theatre, John Burns brings his solo show Gay Kid on a Cattle Ranch to Albuquerque for one-night only! Based on his life growing up in Nara Visa, NM, Gay Kid on a Cattle Ranch is John’s heart wrenching and gut busting coming of age tale of strong family bonds and small town histories, of isolation and loneliness, of loving and letting go. All performed in his unique and exceptionally strong tenor with songs made famous by John Denver, Johnny Cash, Karen Carpenter, Elton John, Queen and many, many others. 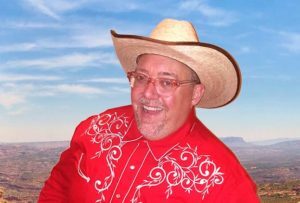 A popular ABQ actor/singer for many years, performing with Albuquerque Civic Light Opera/Musical Theatre Southwest, Vortex Theatre, Adobe Theater, Albuquerque Little Theatre, La Compañia de Teatro de Alburquerque, and New Mexico Symphony, John transplanted to New York to study with acclaimed Maestro David Jones. Since that time he has worked with such esteemed composers as Tony Award winner Jeanine Tesori, Ricky Ian Gordon, Steve Alper & Sara Knapp, and David Friedman & Deborah Brevort, along with legendary director/choreographer Patricia Birch, and Tony-nominated writer/director Tina Landau. In New York, John performed in the fabulously received Stonewall, Night Variations presented by Ann Hamburger’s En Garde Arts and in The Singapore Mikado with Theater 2020, directed by David B. Fuller and Judith Jarosz. He was also featured in workshop productions of King Island Christmas and in two Alper & Knapp productions – Chamberlain: A True Civil War Romance and Rappaccini’s Daughter (alongside Emmy winner Kristin Chenowith and Oscar winner JK Simmons). Previous PostPrevious Show tickets on sale now! Two dates! Next PostNext NEW PERFORMANCE ADDED!